In early 2017, in view of the upcoming 30th anniversary of PowerPoint, Microsoft wanted to know how the application was viewed by “Millennials,” people aged 18‒34. To find out, they commissioned a poll among users of social media (Snapchat and Instagram). To Microsoft’s surprise, they found that 80% of Millennial respondents considered PowerPoint to be “a great tool,” an opinion comparable to people old enough to be their parents (“Gen X”) or grandparents (“Baby Boomers”). The question is, why are Millennials still rating PowerPoint so highly and using it so much, even 30 years after it was released, on 20 April 1987? I think at least three factors might contribute to this surprising result. For one thing, Millennials are the first generation to have seen PowerPoint used widely in their schools when they were children (and many were taught in school how to use the application themselves). Second, it seems a general decline has occurred in writing “long-form” documents (documents of several pages or more, written out in full sentences and paragraphs), resulting in a need for new communication formats to take their place. And third, PowerPoint has been able to respond and expand its range of uses because it was designed to be adaptable enough to take on new formats. First, the schools. Millennials are defined as people aged 18‒34 now, and that means that they were age 5 and starting school over the years 1988‒2004. It’s easy to calculate that all Millennials started school after PowerPoint had become available in 1987! When we designed PowerPoint, during the years 1984‒1987, I was well aware that it would be perfect for teachers to use, because PowerPoint 1.0 was designed to make black and white overheads, and teachers were already some of the biggest users of overhead projectors in their classrooms. (Overheads were large transparencies, the size of a sheet of A4 or USLetter paper; they were ideal for schools because they could be produced cheaply, by hand or with typewriters, and photocopied onto transparency sheets, and the projectors for them were bright enough to be used in fully-lighted rooms. These were the same reasons why overheads were also popular in businesses.) But I thought that schools would be slower to acquire personal computers, usually because of limited funds and limited technical expertise (in those days), so we targeted the marketing of our software to businesses. Still, many teachers bought personal computers for themselves, and they used their PCs to create PowerPoint presentations which could be printed out and copied onto overhead transparency films, to use the existing projectors in their classrooms. This started very early, in PowerPoint’s first years. And teachers who were enthusiasts could see the promise of “digital overheads.” As soon as digital video projectors were improved to be bright enough and small enough for classroom use, they started appearing in schools, along with large monitors. That took about 10 years. As early as 1996, PowerPoint was becoming associated with video presentations; by 1999, that was commonplace. And by about 2000, video PowerPoint from laptops came into classrooms in large numbers. All this history means that most people who are aged 18‒34 in 2017 began to see PowerPoint used while they were in school. By the time they got to university, they often saw nothing else, with video projectors built into classroom ceilings and every lecturer using PowerPoint. If you search articles in academic journals, you’ll find thousands of studies of how PowerPoint is used in classrooms and how effective it is in various styles of use. Studies range from kindergartens in China to universities in Sudan to medical schools in Syria. The application is so widely employed in teaching that such use has itself become a major topic of academic study. Even more surprising, many of the pioneering teachers who used PowerPoint for their own teaching thought it was also important for their students to learn how to use it, because the students would be expected to know PowerPoint in their future classes, certainly by university or in future jobs. PowerPoint—the must-have presentation software of the corporate world—has infiltrated the schoolhouse. In the coming weeks, students from 12th grade to, yes, kindergarten will finish science projects and polish end-of-the-year presentations on computerized slide shows filled with colorful animation, bold topic headings and neat rows of points, each introduced with a bullet mark. Software designed for business people has found an audience among the spiral notebook set. Ms. Tessier also encourages her pupils to write accounts of their lives and present them in front of the class. According to figures from Microsoft, the real star of the classroom may be PowerPoint itself: 69 percent of teachers who use Microsoft software use PowerPoint in their classrooms … . The software is not only a teaching aid, used by instructors as a substitute for a chalkboard. It has become a tool for students to use as well. Suddenly magic markers and construction paper seem so Old Economy. From PowerPoint Invades the Classroom, by Lisa Guernsey, New York Times, 31 May 2001. To sum up: Millennials have seen PowerPoint used widely in their classrooms, and have often been taught in school how to use it. It’s no surprise that they find PowerPoint to be a familiar tool, and that they find it more natural to use than their parents did. A second big factor is a change in the kinds of documents used routinely in businesses, in government offices, in the military, and just about everywhere else. At the time PowerPoint was created, there was a lot of “long-form” writing—that is, documents of many pages arranged logically into sections and sub-sections, with connected paragraphs and full sentences. For example, it was expected that a serious business proposal or plan would take that form. A set of PowerPoint slides could be used to give a talk about such a plan, or could even be written to be a quick summary of the high points, but could not possibly be a substitute for the underlying document. Now, 30 years later, there are leading venture capital investors who used to require a full business plan document before investing millions of dollars, but who now only want to see a few slides instead. I don’t know whether or not there is anything to that reasoning, but it is certainly true that, over PowerPoint’s lifespan so far, there has been a change whereby a presentation has substantially lost its role as an accessory to a written paper and has assumed more and more the role of primary document, with no long-form backup available. PowerPoint has increasingly become the primary communication form. I think such protests often make good sense, but they have been scattered, and mostly serve to underscore the general trend to use PowerPoint for many kinds of communication where papers would have been written before. There is some good research from MIT attesting that people now write presentations where formerly they wrote long prose documents. Given the demand for some sort of communication which is quicker to prepare and quicker to scan than a traditional paper, PowerPoint would naturally suggest itself to people who are already familiar with using it. Finally, a third factor in PowerPoint’s longevity is its adaptability. A strong reason why PowerPoint has been able to fill many unforeseen demands is that PowerPoint was designed to be extremely flexible. 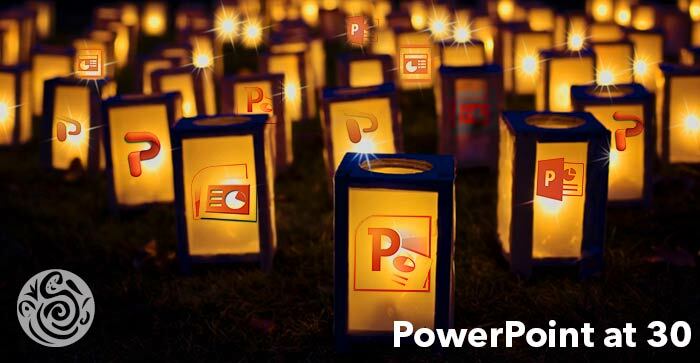 PowerPoint, from the beginning, was designed to create many kinds of documents—even though we decided to focus its marketing very sharply to businesses, from one person in a garage up to multinationals. So the default styles and the examples in the manuals were specifically aimed at business presentations, but even from PowerPoint 1.0 in 1987 those default styles were exceedingly easy to change. The “style” of PowerPoint was only superficial, not limited by the product’s basic architecture, and could be changed by any individual user. Back 30 years ago, there was a division of opinion about how presentation applications should work. Some people (not me) thought that the application should take the user’s “content” and format it to always be “beautiful” according to standards built into the application, without giving the user much control, to guide the user and “prevent mistakes.” I disagreed, and thought that a presentation application should allow the user to control every aspect of appearance very finely, even to make a presentation that would be “ugly” or non-typical, and should be able to recreate any existing format. This difference of philosophy was sometimes described as a basic dilemma: a presentation application could either be easy to use or could give fine control over appearance, but not both. PowerPoint managed to offer both abilities through a rich system of defaults. Every design element had a default for every property that should produce a beautiful presentation (in a current style for business presentations), but every property could also be edited freely. And the whole set of defaults for a presentation could be easily changed by the user to be anything at all. In the 1987 version, this was done by creating any presentation in PowerPoint and setting that presentation to be the set of defaults used for new ones. By 1992, this had evolved to a much better system of “templates” that could be applied retrospectively to change existing presentations, not only to create new ones. A user could start on a new presentation, then apply a template to change all its style settings to those of the template, see the result, possibly apply another template to change it again, and so on. Applying a template could change the backgrounds, change the location of all major elements, restyle any properties of any objects, change all the colors from one scheme to another—just about anything. And any user (or organization) could create an arbitrary presentation in PowerPoint and use it as a template. Always, the only tool needed to set up PowerPoint’s defaults and templates was just PowerPoint itself. This was a lot more work for us than building presentation style into the application, but it meant that the basic PowerPoint application could be used to create any kind of document that was a sequence of pages, each page potentially with a different structure. What people thought was “good presentation style” in 1987 or 1992 was never built into PowerPoint. In later years, the flexibility of the product allowed it to infiltrate many different non-business areas: school and university teaching, children’s school reports and science fair projects, sermons in churches, supertitles for opera houses, diplomatic announcements, giant research posters for scientific and medical meetings, “wet paint” signs, and an endless list of other uses requiring styles far different from the original focus on business presentations. But even in business, usage has changed into multiple new directions. For actual presentation situations, there is a trend for slides to have many fewer words and more graphics, and at the same time there is a trend to use far more words in other PowerPoint files intended to be substitutes for papers. For actual presentations, there’s a lot of interest in the approach used by Steve Jobs and others for ballroom-style product introductions. Big strong graphics (still and video), with almost all the words delivered orally by the speaker. There is a fair amount of university psychological research on why this might be a good idea. PowerPoint from the beginning could do this style easily, with full professional quality, but it is very different from the defaults that people wanted in 1992 or in 1987. We shipped 40 template presentations along with PowerPoint in 1992, which had been designed by the best professional presentation artists at industry leader Genigraphics. Thanks to the remarkable backward-compatibility of PowerPoint, they can still be viewed in PowerPoint 2016, and everything still works—all the styling, all the fonts, all the animations and transitions. If you open one of the presentations today, say on an iPad, it looks great! But it also looks extremely dated, very different from what anyone would create in 2017. For example, there are no digital photos, even small ones, let alone huge photo backgrounds; that’s because there were essentially no practical sources for digitized photographs in 1992 (but PowerPoint did have objects and styles ready to handle them). This is an instructive lesson in how much styles can change, even for business presentations. For other documents, the change reflects the decline of long-form writing. This style tends toward very dense “slides” which are really intended to be read on printed pages or viewed on PC screens, never to be projected. Often, they are “presented” only in a one-on-one meeting where the author turns over the pages with his reader, and more often still are merely read by the recipient alone. They tend to include long quoted paragraphs and even footnotes in tiny font sizes—very far from the defaults that experts were so keen to enforce in 1992 or 1987. PowerPoint has proven malleable enough to accommodate these different changes, because individual users can make whatever use of it they want. If PowerPoint had been designed to narrowly restrict its output, it might well not have survived so long and in so many ecological niches. Things change a lot over 30 years. The style of presentations has changed, while the uses of presentation software have expanded into several different purposes in businesses, and expanded into many unforeseen uses throughout society generally. Perhaps it really should not come as a surprise that the generation schooled to use PowerPoint, when faced with new requirements, would find innovative ways to use the tool they already knew well. Robert Gaskins invented PowerPoint, drawing on ten years of interdisciplinary graduate study at Berkeley and five years as manager of computer science research for an international telecommunications R&D laboratory in Silicon Valley. Gaskins managed the design and development of PowerPoint as a startup where it attracted the first venture capital investment ever made by Apple Computer. It was released for Macintosh in April 1987; soon after, it became the first significant acquisition ever made by Microsoft, who set up a new business unit in Silicon Valley to develop it further. Gaskins headed this new Microsoft group for another five years, completing versions of the PowerPoint product through the explosive initial growth of Microsoft Windows and the creation of the Microsoft Office bundle.